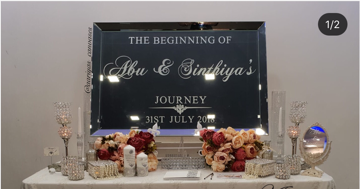 All packages include the personalised mirror/canvas, personalised vanity mirror with initials and date, and a matching guest book. We also cater to the theme/ colour you’re after, free of charge. Flowers on table is all part of package .